A monofilament wig is a medical wig which is fixed to a base that imitates your scalp and is extremely comfortable and natural-looking. Both quality and skill are brought together in these wigs to guarantee you peace of mind. A monofilament wig in high quality, synthetic fibre is the perfect solution for women who want an undetectable medical wig. 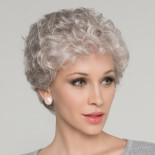 We have a huge range of colours and styles for you to choose from, so you’re sure to find a wig to suit you. And if you can’t find a monofilament wig that you like, you can choose from our wide selection of turbans and scarves.